Complete Control Wood Pellet 3-Oven ECO Cooker £8,950 Inc. VAT. Dimensions: 1,500mm wide, 910mm high, 710mm deep. Easy to use, the Thornhill Range Complete Control Wood Pellet 3-Oven Range Cooker provides you with a choice of cooking options and gives beautiful ambient heating for your kitchen when you need it. We’re proud to say this oven is the world’s first wood pellet range cooker and it has an ultra-low impact on the environment! To use, simply pour pellets into the hopper located underneath the induction hob on the left hand side of the cooker. The wood pellets are available in sacks and the hopper will need to be filled up from two or three times a week to once a fortnight, depending on how much the cooker is used. We’ve designed the wood pellet range cooker to give you control when you want it. It can be set with a time clock, to come on and off when you want it, in the same way as your central heating system, or it can be simply fired from cold. Perfect for all types of cooking, the wood pellet range cooker gives you a combination of three ovens, two hotplates and an electric induction hob. Not sure about which fuel to use, see our cooker fuel guide page, click here. Included in this price is a 1 year parts & labour guarantee and a 5 year parts guarantee. The Thornhill Range Pellet 3-Oven Range Cooker is 1,500mm wide, 910mm high and 710mm deep. Thornhill oven size: 357mm wide, 281mm high, 520mm deep. 52 litres. Aga range Cooker oven size: 350mm wide, 260mm high, 480mm deep. 44 litres. Click here for all the technical information you could want! 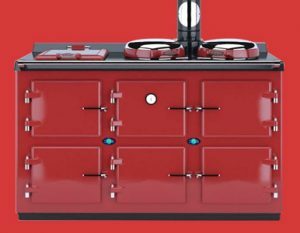 For colours, please click on the Virtual Configurator and design you own cooker. Hi Graham, I can’t tell you how much I love my range cooker, she’s worked beautifully since the day I turned her on.We had 12 for Christmas dinner and everything was cooked and kept warm to perfection thanks to the cooker, she is the heart of the house.